Malibu legend, Kemp Aaberg stopped by recently with this donation. Bruce Brown once used it as a prop in one of his earlier movies as a skit device. 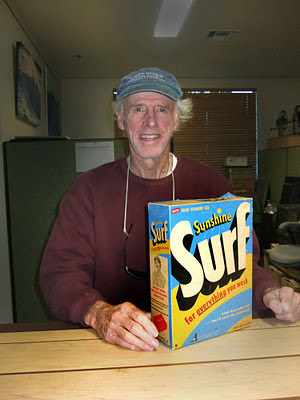 Kemp is an accomplished Flamenco guitarist as well as the surfer whose soul arch photo, taken by John Severson, became the Surfer Magazine logo for decades. We're going to be interviewing Kemp (and hopefully his brother Denny) for our Oral History Archives and will post those on our website, but until then you can read an interview conducted with Kemp in Liquid Salt online.